The Los Angeles County Sheriff's Department said residents called the cops when social media went down. When Facebook goes down, you can gripe on Twitter, or even go outside. Or you can call the cops. That's what some Los Angeles County residents apparently did on Friday when the social media network went down for a few hours, according to tweets from a Los Angeles County Sheriff's Department sergeant. 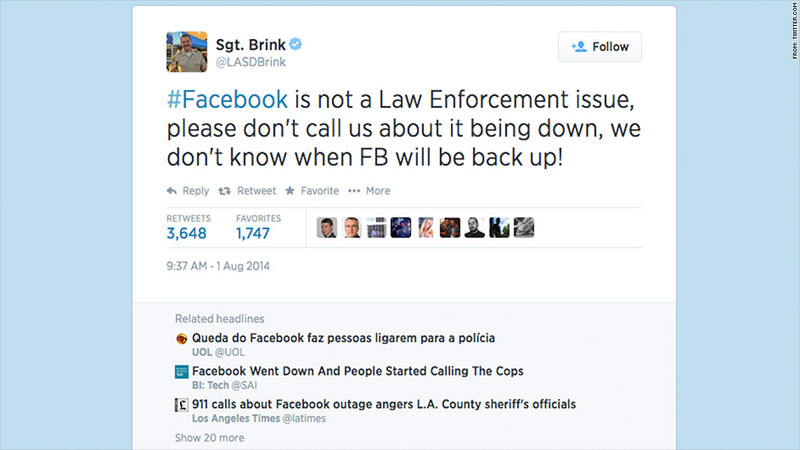 "#Facebook is not a Law Enforcement issue," tweeted @LASDBrink, aka Sgt. Burton Brink, on Friday morning, "please don't call us about it being down, we don't know when FB will be back up!" "We get calls all the time like this," @LASDBrink wrote about 20 minutes later in response to questions about his tweet, "cable TV, all sorts of things not working, they think we control." Calls to Sgt. Brink have not been returned. The Sheriff's Department's website lists Sgt. Burton Brink as its community relations sergeant, and @LASDBrink is a verified account, which generally means Twitter (TWTR) has deemed it authentic. In a later tweet, @LASDBrink said they had gotten an unknown number of calls "on 911 or reg number". The Los Angeles Police Department, which does covers different jurisdictions from the Sheriff's Department, said it did not get any calls about Friday's outage. It's not the first time that people have called law enforcement to complain about domestic issues: Last summer, residents of a Connecticut town called 911 when a cable outage interrupted viewing of the popular TV show "Breaking Bad." The LAPD also estimates that 70% of calls to 911 this year have been non-emergency calls, including a man who called to complain that he hadn't gotten cheese on his hamburger.